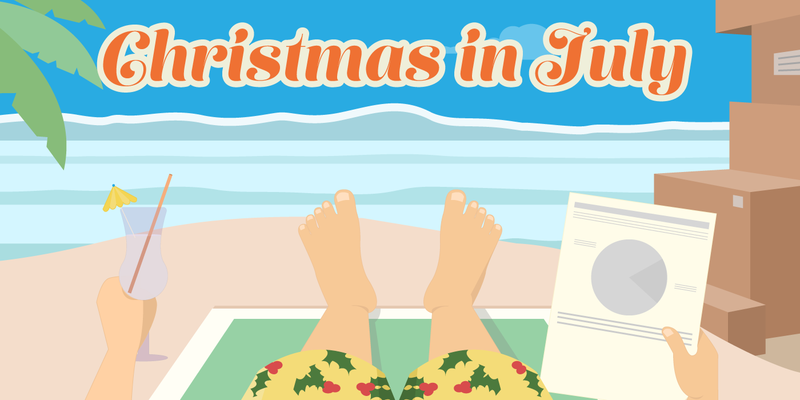 You’ve all heard the saying, “Why not have Christmas in July? !” In eCommerce, this concept is not so far fetched when it comes to planning your marketing strategy. Just a few short months away, retailers are going to be hitting the holiday season – first Halloween, then Thanksgiving, and WhatDoYouKnow!? straight into the December holidays. Planning is going to be essential, and what better time to plan than when the weather’s nice, the days are longer, and you’re not gearing up for the rush of the holidays?! Now we realize that you just want to think about that umbrella drink and vacation with your family this summer. And that’s ok, you can do that too. Little by little, over the course of the next 30-60 days, get your marketing plan locked down for this years’ holiday rush, and we’re going to give you some tips to get organized to do just that. This is an “all hands on deck” time of year so you’ll want to start considering what resources you’ll need to staff up. Start writing your job descriptions and identifying companies that will get you in line for where you need to be when the ‘go’ button is turned on. Hire out your weaknesses and find specialists that excel in areas that you can hire out vs generalists that might do a little bit of everything. Pick up a calendar from your local dollar store and start plotting out the plan for your daily content across social media, blogs, guest blogs, product placements, etc. Whether you are a small 2-person mom and pop retailer or a large multi-national brand, having a plan in place for every day of the week leading up to the middle of January is going to be essential. As you know, shoppers during the holidays want to see offers and specials from huge discounts to free shipping. What are you going to offer this year, and when? If you work with various agencies for branding, social, PR, and other forms of on and off line marketing, ask to meet with your teams today so you can strategize over what will be the ground breaking direction to crush those holiday sales. You’ll need offers, contests, graphics, creative, personalized notes, blog posts, product placements/mentions, and more. You’ll want to increase budgets and be flexible to change as you’re seeing more action in certain areas. A lot of times with budget increases, it will need to happen gradually vs throwing a bunch more at certain channels with the expectation of achieving more gains. Start to ramp those budgets up now so when it’s time, you can capitalize on the increase in opportunity. Start pushing sign ups today so you can have a healthier list in October. Now is the time to be running contests on social media to collect more email addresses to add to your list. Make a plan for your drip marketing, abandoned carts, loyalty programs, etc. Test and test now, and then take those winners and refine them with great offers for each of the main holidays. Not everyone will be able to partner up with big names like DJ Khaled to push their products across social, but there are bloggers, and other influencers that you can work with, and that can help sell your products to their audiences. Identify your list of potentials, and start reaching out now with opportunities that will be meaningful to your bottom line during the holiday rush. *Pro Tip – if you’re selling t-shirts with dogs on them, find some dog lovers on Facebook, Instagram, YouTube, and SnapChat that have huge followings, and reach out to them to find out how you can work together. What are you going to do to advertise during this holiday season on social media? What kind of offers will be a part of your strategy leading up to Black Friday, Christmas, and New Years? How rapidly will those offers change depending on the closeness to the holidays? Will you be doing any testing per channel (Facebook, Instagram, Pinterest, SnapChat, Twitter)? Then, what are you going to do for Product Retargeting? Will you be managing this yourself? You have options but getting a well oiled machine today will enable you to blast off during heavy traffic times. Have your “web guy” do it, an agency or find a self service model like Flightplan. Either way, make sure you are capturing as much opportunity out of your site traffic as possible. *Pro Tip – test and ramp up new channels of marketing during off seasons. Start now so you can get the engine started and figure out which products are selling the most and what products are dead weights. Or find out which tag lines from your ads will lure customers back to make those purchases. Let your retargeting campaigns build up momentum and by the time the holiday’s come around, you will have that program running on auto-pilot at full steam. If you have been considering trying new channels like SnapChat for your business, claim your business name and play around with it now during slower times. Build up your audience so when it’s go time, you are a SnapChat pro, and are driving personalized commerce at the best times, to the right people, and know how to ‘sell and story tell’ your products in an engaging way. Or maybe you’re considering testing out Buyable Pins on Pinterest. Test around with building collections and seeing what works best among various audiences. A lot of learning can be uncovered over the next couple of months that you can apply to blast off those sales during the holidays this year! Shopify has made this channel very approachable, and if you’re been curious to learn how to sell on it, now is most definitely the time! Typically, when we think about marketing, we often times focus on the driver of the traffic click. SEO, SEM, Social, Display, etc. It’s also important to consider on-site marketing opportunities around the holidays. This is a time that people are doing a ton of shopping online for other people. Onsite personalization will not only enable your visitor to see more of your products, but also give them more options to make purchases. As an example, if a man is shopping online for his wife and knows that she loves a particular style of bikini, he might be more apt to purchase a few of them in different colors and similar styles if you make it easy for him to do so. Or he might purchase accessories that will compliment the bikini he’s already purchasing for his wife. Help him do that with your Shopify store. There are various apps that you can add on to your existing store that will enable your shoppers to have a more personalized shopping experience including recommending similar products or compliments to products already placed in the shopping cart or viewed previously. These apps range in complexity and features, and again will need time to ramp up! Well, we hope you enjoyed some of the ideas for planning out your marketing strategy for the holidays as a retailer on Shopify. These are just some of the various things to consider now, instead of later, to be well positioned to capitalize on your 2016 holiday sales. Having a plan will help you to get focused on maximizing your sales during heavy traffic times. Starting campaigns now and building up your lists will only serve as training for the big fighting day! And while you’re add it, why not dust off that mistletoe and mix up some iced egg nog as inspiration to start your planning now! Cheers. Thanks for your feedback! We are always open to optimizing our content strategy to be the best it can be. Thanks for your suggestions.